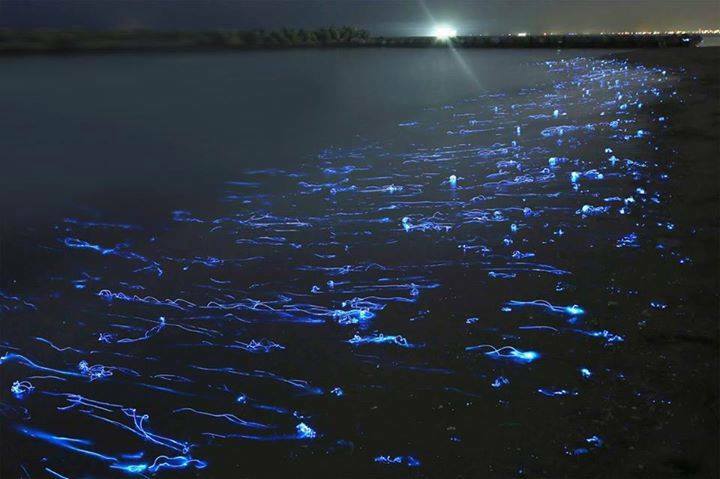 The firefly squids are small bioluminescent creatures, found in deep waters surrounding the coastline of Japan. They have eight arms and two tentacles, each with suckers and hooks. Sparkling enope squids is another name and so is “hotaru-ika” (Japanese). 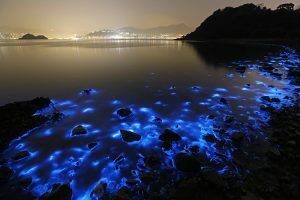 They are named so because they resemble fireflies. Size: Adult firefly squids are 1.5-3 in (4-8 cm) long. Weight: They weigh around 0.31 oz (9 g). Color: Some are yellow, while others are either white or blue. They emit a strong blue radiance through the dotted photophores (light producing cell) found on their head, mantle, hands, and tentacles and around the eyes. Their mouth cavity exhibits a dark pigmentation. They live in the western Pacific Ocean. 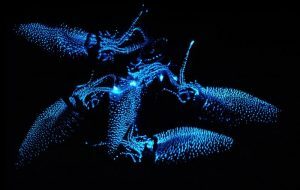 Firefly squids are typically twilight zone inhabitants, dwelling at a depth of 600-1200 ft.
Like other squids, they make movements by jet propulsion, using their tentacles. In spite of living in the deep ocean, they come to the surface at night either for hunting or for spawning their eggs. 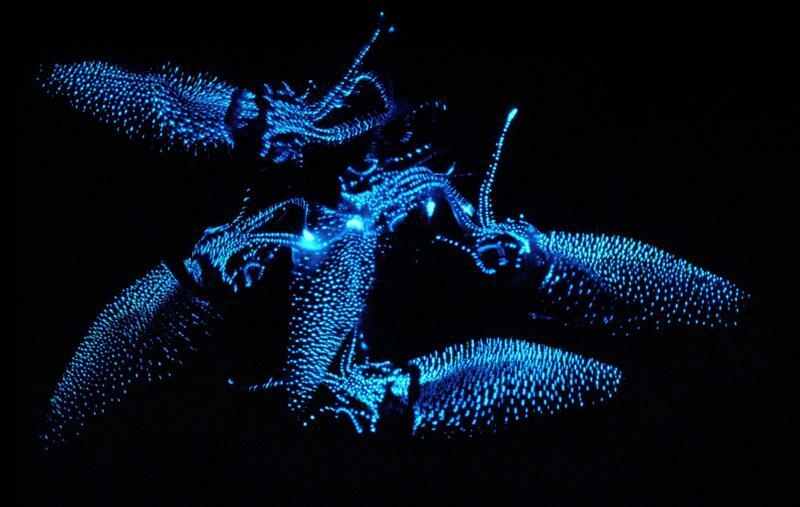 Being a second level consumer in the food chain, firefly squids wisely flash their lights to catch the attention of planktonic crustaceans, small fishes, crabs, and shrimps. Once the preys come closer, they use their strong tentacles to attack and devour them subsequently. Their mating season starts around March and lasts up to June. 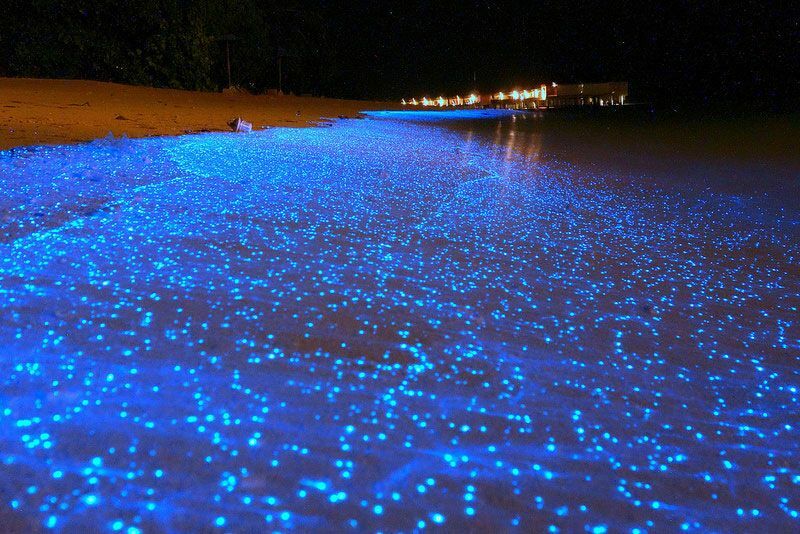 During this time, adult firefly squids produce a deep blue light to attract their prospective mates. During February to July, millions of female squids gather at the shoreline for laying eggs. After the eggs are discharged into the water and fertilized, the females die subsequently. The eggs hatch within 6-14 days, depending on the temperature of the water as warmer waters are conducive to faster hatching. Usually, the water temperature stays between 42°F-57°F. They attain sexual maturity when they are around 1 year old. Firefly squids live for 1 year. Their bioluminescent photophores are used to communicate with other squids. Firefly squids use their bioluminescent photophores in a way that they appear bigger than they really are. It confuses and wards off their predators. 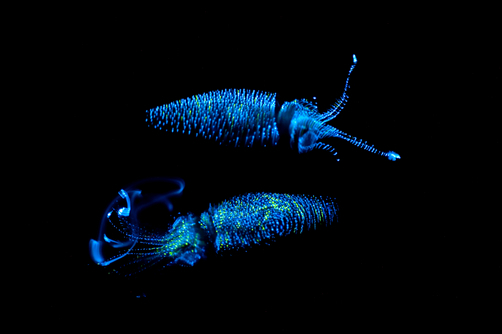 These squids also light up their whole body for matching the background they live in (counter-illumination) to save themselves from their potential threats. They have three visual pigments or light-sensitive cells and double layered retina, which allow them to differentiate between bioluminescence and ambient light and to decipher the color pattern produced by other members of the squid family. Sperm whales and killer whales prey upon firefly squids. 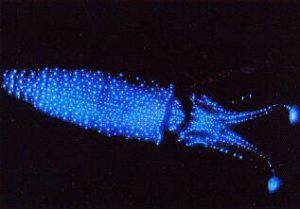 The firefly squid is enlisted under the “Least Concern” category and their population is considered safe. Firefly squids have more than 800 photophores on their body. They are edible and considered a delicacy in many countries, especially in Japan. They are capable of flashing the lights in countless patterns, either in unison or individually. Their largest photophores are always on the tentacles. They are the only species of their genus. The Toyama Bay in Japan, where the squids annually appear at the time of spawning, is officially announced as a natural monument by the government. The illuminated shoreline is a popular sightseeing destination for thousands of tourists and locals. Since the bay is located in a V-shaped canyon, due to some geological reasons, the ocean currents push the squids towards the shore. This incident is known as “squid drowning themselves” by local people.